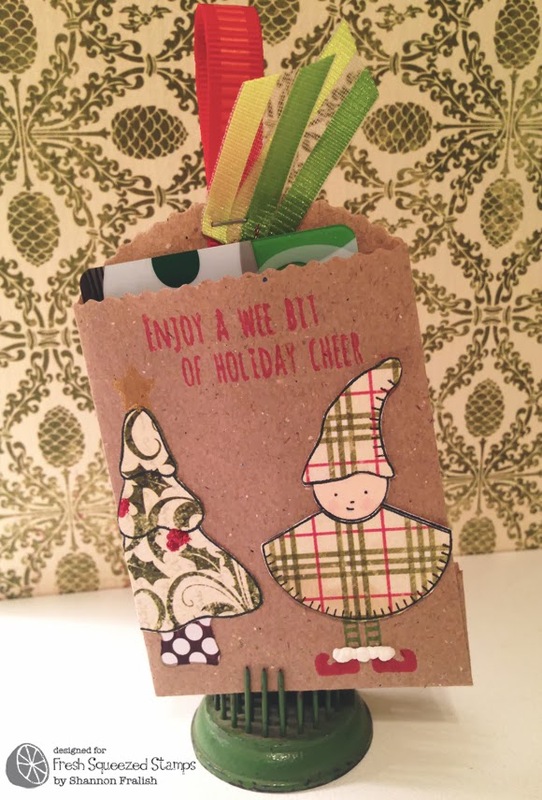 I had just a bit of time today, before my 7-year old niece's performance in The Music Man, so I put together this little gift card holder using A Wee Christmas stamp set by Fresh Squeezed Stamps. I snapped the photo with my iPhone, so excuse the less-than-professional quality, but I thought this turned out pretty cute considering I simply used stuff from my stash. I'm also proud of the $10 Starbucks gift card inside, since I only paid five bucks for it…suh-weet! I used a mini kraft bag from Canvas Corp, and that's Authentique paper, Hero Arts shadow inks in pale tomato and green hills, a bit of puffy Liquid Applique, and some Delicata golden glitz ink on the star (the photo just doesn't do it justice). The red ribbon is looped, so this can hang on the Christmas tree, too.